Located just outside of Wimberley in in the heart of the Texas Hill Country, Serenity Farmhouse Inn & Resort is a charming bed and breakfast that offers a selection of romantic rental accommodations, including cottages, suites, and the private Gabriella’s Garden Hut guest home. Set on 22 acres of pristine landscapes with beautiful views over the scenic Hill Country, and within a short drive from Wimberley Square, the bed and breakfast inn features luxury accommodations that are comfortably furnished and decorated with vintage furniture, queen-size beds, bathrooms with heart-shaped whirlpool tubs, fireplaces, and private porches and fantastic views. The beautifully manicured grounds of the Serenity Farmhouse Inn & Resort feature an outdoor flagstone swimming pool with an attached hot tub overlooking the surrounding hills and guests are treated to a delicious, fresh country breakfast every morning, which is delivered to the doors of the lodgings. Other upscale amenities include massages and spa services, and special occasion packages with extra touches such as cake and flowers, picnic baskets. Serenity Farmhouse Inn & Resort features a variety of charming and romantic accommodations in the form of luxury suites, cozy cottages, and a lovely guest home. Luxury suites are available in the main farmhouse and are decorated in soothing landscape hues and furnished with French antiques and vintage pieces. These elegant abodes feature overstuffed armchairs, plush queen-size beds with pillow-top mattresses and high-quality linens, custom-made draperies, and private bathrooms with heart-shaped whirlpool tubs, separate showers or bath/shower combinations, fluffy towels and branded toiletries. Suites also have kitchenettes with mini-fridges, microwaves, and coffee makers and boast beautiful views over the countryside. Cottages are comfortably furnished and decorated with vintage furniture and period pieces and have bedrooms with plush queen-size beds with pillow-top mattresses and high-quality linens, and private bathrooms with heart-shaped whirlpool tubs, separate showers or bath/shower combinations, fluffy towels and branded toiletries. Living areas have ample seating, stone fireplaces and in-room conveniences such as mini-fridges, microwaves, and coffee makers, and shared or private porches offer breathtaking views over the surrounding hill country. Cottages include White Willow, Hill Country Hideaway, Rosie’s Retreat, Poet’s Cottage. Gabriella’s Garden Hut is a beautifully appointed stand-alone cottage on the property that offers extra levels of privacy and space. The charming cabin features a large master bedroom with a queen-size four-poster bed dressed in high-quality linens, a clothing armoire and plush armchair, and an en-suite bathroom with a double vanity, large shower with a dual showerhead and a two-person whirlpool tub. The cottage has spacious living and dining areas with a fully equipped kitchen and breakfast island, stone fireplace, and extra sleeping space for two guests, and two private patios with tables and chairs are perfect for relaxing and soaking up the views. Serenity Farmhouse Inn & Resort offers a unique alternative to a traditional bed and breakfast with the Wine Country Retreat Village, an exclusive bungalow village that provides comfortable accommodations for more extended vacation stays. Bungalows are stylishly decorated and have vaulted ceilings, large picture windows, intimate bedrooms, fully-equipped kitchens, spacious living and dining areas, private decks, and panoramic Hill Country views. Premium upgraded bungalows also offer expanded terraces, private hot tubs, and outdoor garden rooms, with access to the longhorn pool and grill area. A delicious, fresh country breakfast is delivered to the doors of the lodgings and includes freshly brewed coffee, tea and other hot beverages, fruit juices, fresh fruit platters, yogurt, cereals, hot entrées and signature dishes, eggs, and freshly baked bread, muffins, scones and more. Deluxe amenities and guest services at the Serenity Farmhouse Inn & Resort include a delicious, fresh country breakfast every morning, an outdoor flagstone swimming pool with an attached hot tub overlooking the surrounding hills, and beautiful gardens in which to relax. Guest services include in-room massages and spa services, and special occasion packages with extra touches such as cake and flowers, picnic baskets. 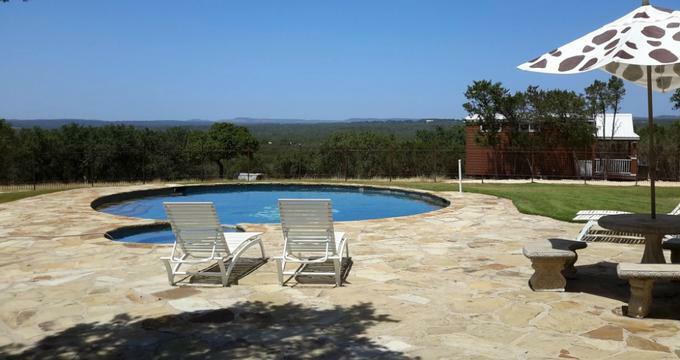 Recreational activities in the area include over 60 vineyards, wineries and tasting rooms, Jacob's Well, the third largest swimming hole in Texas, Hamilton Pool, Pedernales Falls State Park, and the historic Blue Hole swimming hole and park, and beautiful drives through rolling hills and farmlands. Other attractions include Blanco, the lavender capital of the Hill Country, the historic town of Gruene, which is home to Gruene Hall, the oldest dance hall in Texas, the historic town of Luckenbach, and Fredericksburg.